If you’re looking for relief from your painful dental emergency and have searched “emergency dentist in Detroit” endlessly on Google to find it, you’ve found what you’re looking for! Gone are the days where patients have to wait weeks for an appointment to see their regular dentist for a dental emergency. Thanks to our 24-hour Detroit emergency dentist referral network, we’re now able to book appointments for patients seeking relief from their painful dental emergency in as little as 24 hours. If you need immediate help, call us at (855)-352-6790 so we can get cracking on booking you an appointment. While we focus on booking the appointment for you, it’s your job to focus on gathering what you’re going to need to bring to your future appointment. Your driver’s license or another acceptable form of personal identification will need to be presented to the emergency dentist and their staff upon your arrival. Any recent x-rays or paperwork from a trip to your regular dentist should be brought and presented, as well. Making a list of the current medications you’re taking on a regular basis and any known allergies you may have to give to the emergency dentist and their staff is also a good idea. It gives them something to refer to in order to be completely sure that nothing they give you during your appointment causes a negative or allergic reaction. By now you should have received the call from us to give you the time, date, and location of your appointment. We suggest that you call ahead to see if your dental insurance through your current insurance provider is accepted. If it isn’t accepted, or you don’t have insurance, we then suggest you ask for a quote. Doing so ensures that there will be no surprises once it comes time to pay. Because emergency dentists operate much like your regular dentist does, you’re going to need to arrive 15 minutes early. You’re going to need this time to fill out necessary paperwork, ask questions, and address any concerns you may have. Speaking of concerns, remember to let the emergency dentist and their staff know if you have a fear of the dentist and general anxiety over your appointment. The more they know about how you’re feeling, the more they can help you be calm and stay relaxed throughout your appointment. 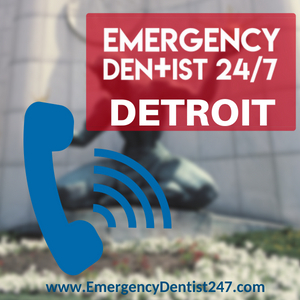 Make no mistake, emergency denture repair in Detroit is just as much of an emergency as a broken tooth is. 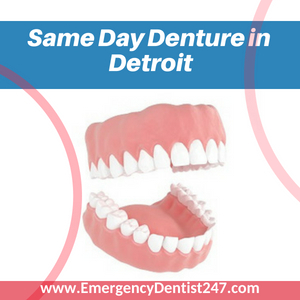 Thankfully, we can now not only offer patients emergency denture repair in Detroit, but we can also offer same day denture repair in Detroit, as well. This is all made possible by the emergency dentists within our network having either close working connections with denture lab technicians or having denture lab technicians working directly in their office. Either way, you can now have your dentures repaired or be fitted for a new pair all on the same day, during a single appointment. The best way to prepare yourself for a dental emergency is to know a bit about them and what you can do if one happens to you to turn it around in your favour. More importantly, however, you must remember that any sustained head trauma will always come before oral emergencies. Having a tooth knocked out or otherwise lost in a different way can be a scary situation, but you must remember not to panic. Assess yourself and make sure you don’t have any other sustained head trauma before you start looking for the tooth. 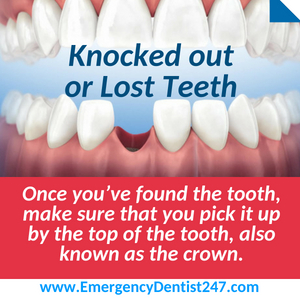 Once you’ve found the tooth, make sure that you pick it up by the top of the tooth, also known as the crown. Picking it up by the bottom of the tooth, also known as the root, will damage it, possibly to the point of no return where the emergency dentist cannot implant it back into the empty socket due to damage. The best way to preserve a lost tooth on a temporary basis is to try and put it back in the socket yourself until an emergency dentist can permanently put it back in. The next best way to preserve a lost tooth is to store it in a cup of either milk or water. Oral infections as a whole are extremely dangerous and should never be left untreated under any circumstance. They are a time-sensitive and life-threatening dental emergency that acts just as a bodily infection does. They spread, grow, and fester, eventually hitting the bloodstream and becoming a serious emergency. 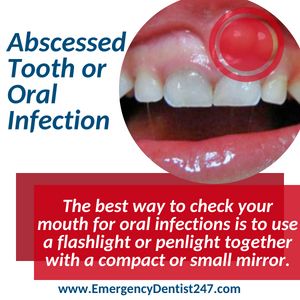 The best way to check your mouth for oral infections is to use a flashlight or penlight together with a compact or small mirror to check thoroughly around your mouth. Look for anything that looks like a pimple or a swollen, red bump. Unfortunately, oral infections aren’t always so easily spotted, especially when you’re dealing with an abscessed tooth. Abscessed teeth can form from something as simple as a minor chip along the gum line. Though the chip may be minor, it has created an opening to the inside of the tooth where your toothbrush cannot reach. Oral infections can kill you just as a bodily infection can. You must call us immediately if you even suspect for a moment that you have one. Fillings and crowns are put in place to protect and restore a damaged tooth to begin with. They aren’t built to last your entire life, however, so it’s extremely important that you act fast when you lose one. 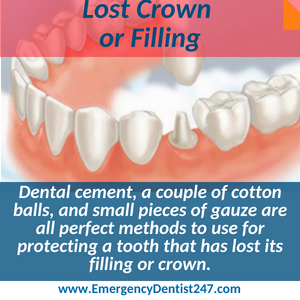 Dental cement, a couple of cotton balls, and small pieces of gauze are all perfect methods to use for protecting a tooth that has lost its filling or crown until we can get you in to see an emergency dentist. No matter which method you choose to use, you must be consistent and keep the tooth protected and covered at all times. Leaving the tooth open and exposed is the best way to damage it further, which will force the emergency dentist to have to perform an emergency tooth extraction instead of refilling or recapping the tooth. If you’re scheduled to have an emergency tooth extraction, or were told that you need one at the last minute, don’t panic. The best way to be prepared for an emergency tooth extraction at any point is to have an understanding of what to expect and what the procedure entails. 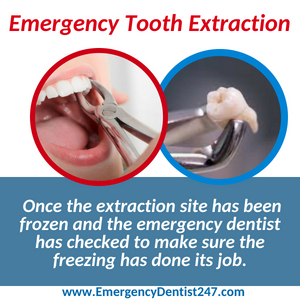 Once the extraction site has been frozen and the emergency dentist has checked to make sure the freezing has done its job, he or she will make a couple of incisions using a scalpel to help with the loosening of the tooth. Using a set of dental pliers, the emergency dentist will then attempt to remove the tooth. If the tooth proves too difficult to remove whole, he or she will have to break it up into smaller sections and remove each piece. Once the tooth is extracted and you’ve had a couple of minutes to wind down, the emergency dentist will then take some time to go over important aftercare instructions. You will need to religiously follow their instructions at home in order to keep the extraction site clean, free of infection, and to ensure that the amount of time it takes for it to heal will be as minimal as possible. 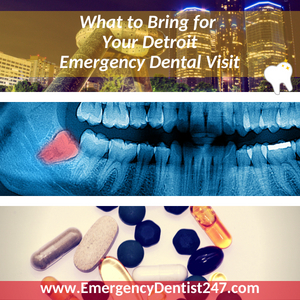 There are certain situations and accidents that require you to determine whether you need a trip to your local emergency room or an appointment with an emergency dentist in Detroit, which we will book for you. A prime example of this would be a car accident, for example.